Our original completion date was November 17, then it was December 3, and now, I'm hoping we are done before Christmas. Some of it was changes that we made to the project and some of it was unforeseen things that came up as the project progressed (like rotten window sills and NO waterproofing under our siding). Either way, this project seems to be dragging on and on and on, and I just want it to be done already. 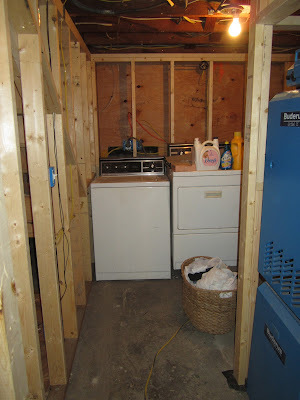 Last month, we left off with the house being jacked up and before that it was all about demo. This month we are onto framing. Framing makes a HUGE difference. It really defines the space down there and makes it feel like separate rooms instead of one big nonsensical space. Actually, now looking at the pictures, it still doesn't really make sense. Sorry. When you come down the stairs, you come into the mud room, where we will have a bench seat for people to take off their shoes- that's what you see here. Then you turn to your left and enter the family room through, what will be, french doors. We are building in a large media cabinet and bookshelves on the wall at the end of the room. Due to the earthquake retrofit, we have to build "counters" around them so the TV will be centered on the wall below with built-ins on either side and a counter top below. On the opposite wall, there will be new windows and another counter top (the boarded up windows are broken and leaking water...awesome). With this counter top, we were able to hide all of our plumbing pipes inside, so we won't have a big pipe running in front of our window. Next to the window wall, we built in a huge storage area. Since we had that huge space with dirt, we decided to take advantage of some of that non-usable space and build a storage room. I've been calling it the bad kid room (joking). Right next to the storage cabinet, we did a built in bench seat. This was the brain child of my mother in law, and it was a great idea. This is one of those "change orders" I referenced earlier. Even though it cost more time and money, I think it will be worth it. We were able to use dead space and I think it will make the room feel larger! The laundry room is very hard to photograph due to the small space and awkward angles, but it finally feels like its own room, which is exciting to me because I spend A LOT of time in there these days. Baby + puppy x rain = lots of laundry. From what they tell me, after framing finishes up, things will "fly." I'm really excited for that.